Look carefully at this radiograph. These are the fourth, fifth and sixth cervical (neck) vertebrae of a 14 year old equitation horses with severe left forelimb lameness. Let your eye move along the top edge of the bones from left to right. Do you see the fracture fragment, irregular boney growth (exostoses), and loss of joint architecture (degenerative joint disease) at the top joint (dorsal facets) between the last two vertebral bodies? This is arthritis, and it can develop in the neck in the same way it can in any other joint in the body. The joints between each of our vertebrae, whether horse or human, have the same function as any other joint in the body, which is to cushion compression forces during motion . In the horse, particularly jumping and dressage horses, flexion of the neck during athletic performance increases the compressive forces on the lower neck joints, or C3 through C7. Over time, this repetitive trauma can overcome the body's natural ability to dampen these concussive forces. Inflammation results, with subsequent degradation of joint fluid and intervertebral disc material. Ultimately, in an effort to stabilize the joint, the body begins to lay down additional bone. What was once a dynamic, spring-like mechanism, becomes brittle and rigid. This is degenerative joint disease (DJD), commonly called arthritis. In the neck, DJD can be responsible for clinical signs as subtle as occasional tripping, progressing up through severe neurologic instability. Primary forelimb lameness is an unusual, but well documented, clinical sign occasionally caused by cervical DJD. All other causes of forelimb lameness must be ruled out with a careful lameness evaluation and localizing nerve blocks before such lameness is attributed to cervical DJD. The dorsal facets are the knobby boney structures at the top of each cervical vertebral body. The positive clinical outcome of injecting anti-inflammatory and lubricating medications (steroids and hyaluronic acid) into the space between the dorsal facets is well documented. The sterile injection procedure is done with ultrasound guidance in the standing, sedated horse. The response to injections varies considerably from horse to horse, both with respect to effectiveness and duration. In addition to intra-articular facet injections, modalities including acupuncture, laser therapy and physical therapy by a QUALIFIED equine physical therapist can provide important benefits to horses with cervical DJD. 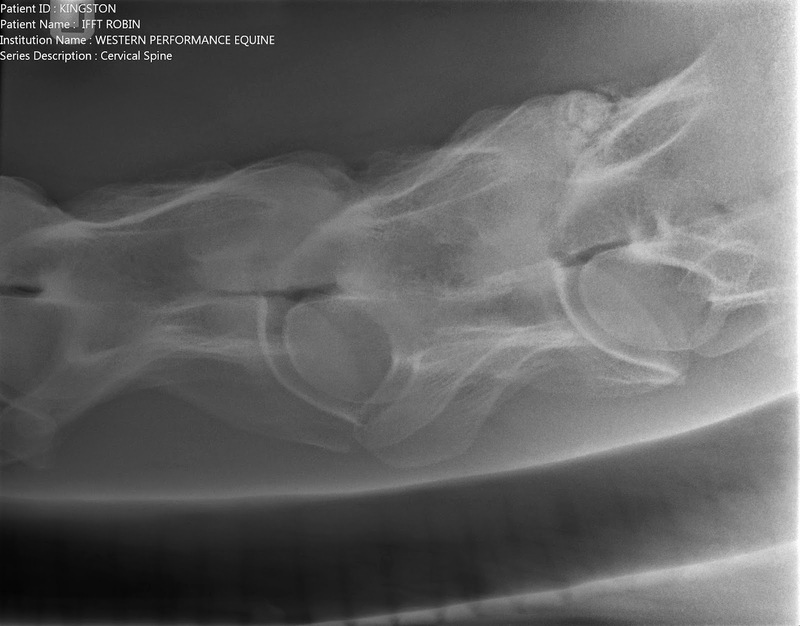 The horse with the radiographic changes pictured here improved 75% after facet injections, however, the severity of these radiographic changes and of his lameness were cause for retirement to pasture turn out. His owner and trainer were happy to honor him with this option in return for his years of service as a show jumper and equitation horse. If your horse has unexplained stiffness, difficulty turning, repeated tripping, or undiagnosed forelimb lameness, ask your veterinarian about the possibility of a neck problem.